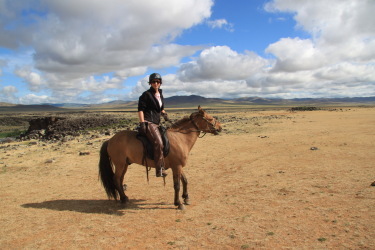 Horse riding in Mongolia - How to ride a horse in Mongolia - Advice for foreign riders - By Mongolia Travel and Tours. Check also the requested equestrian ability for our horse riding tours and the saddles we use for these tours. Will my horse be used to English or Western riding? Before riding a horse in Mongolia, it is important to know the basics of equestrian Mongolian tradition, because that is how the horses you will ride have been trained. 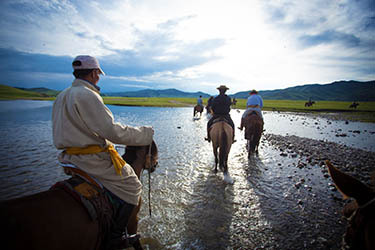 Of course, you will not use the traditional Mongolian saddles - as Mongolia Travel and Tours provides specific tailor made saddles adapted to Foreign riders - but you have to adapt the way you ride to your Mongolian horse. The traditional Mongolian tack is adapted to the specific equestrian technique of Mongolian riders, this horse riding technique itself being adapted to the particular morphology of the Mongolian horse! High over the back of the horse, the rider stands on his short stirrups when trotting or cantering. The front of the saddle, which is very high, holds him and prevents it from putting too much weight on the forehand, which would be disastrous for the Mongolian horse which is naturally balanced on the forehand. The back of the saddle, which is steeply inclined, allows the rider to sit, and even lie back to slow or stop his horse, after a vocal warning, carrying the weight on the hind-legs. The reins in one hand, the rider gives an indication of the change in direction by applying the bit ring on the cheek of the horse. But it is the movement of the body weight of the rider which is crucial, given its huge relative importance, with a 350 kg horse. In addition, the Mongolian bridle is not designed as a brake. The stop is performed as we have said above, mainly by using the seat. In summary, by releasing the back of the horse from the large mass of the rider, this really unique horse riding technique has brought back the small northern steppe horse to a natural locomotion. By placing the rider's weight at the end of an "arms leverage" (ie the seat height), this specific equestrian technique uses the weight of the rider to drive the horse. Thus, the weight becomes the main tool of the rider! This also explains the absolute stillness in the saddle required when the rider wants to go straight. When you are riding a horse in Mongolia, always keep in mind the specificities of Mongol training described above, and the fact that your horse lives free in the steppe about 10 months out of 12. You will need to both adapt to a different riding technique, and to a horse that can "overreact" to behaviors that seem trivial for western horses. But conversely, you may find that some things that frighten our western horses are perfectly tolerated by the Mongolian horses, especially the fact of using the lunge of the bridle to tie them to their own front leg! Always approach your horse very carefully, do not surprised it. This recommendation applies to all horses, but even more for the Mongolian horse which relies only on itself to survive for most of the year. Do not make sudden movements when you're riding, ask the group to stop and get down to dress or undress. Do not lean forward because the horses often do large head movements up to get rid of small flies that bite the inside of their nostrils and ears. Do not gallop or trot sitted, stand on your stirrups as much as possible. Keep your reins in one hand, use only neck reins. Do not use your legs to ask your horse to walk, trot or canter. Just say "Tchou" with an air of conviction!! Get off keeping your foot in the stirrup, this is what your horse is used to and you could scare him as you drift as we do along the saddle. Avoid loose clothing that might be flapping in the wind. Instead of a poncho, choose a raincoat. Check also the requested equestrian ability for our horse riding tours.